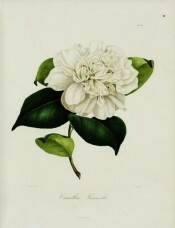 A cultivar of Camellia japonica L., ‘Grunellii’ has pure white flowers, full and irregular, often 14cm across, anemone form, with a resemblance to ‘Waratah Alba’. The 2-3 outside rows of petals are reflexed and twisted, the centre of the flower bearing many small, distorted petals, making a large spherical mass. [ICR]. It was bred in Italy in 1834. [ICR]. Berlèse Iconographie vol.II pl.132/1843. Listed in the 1850 and 1857 catalogues [T.226/1850].